4500 parts! Now you can build the cruise ship of your dreams, Your plans would include options to build the Disney Wonder, Disney Magic, Disney Fantasy or Disney Dream. Please support this project! Video of the Lego Disney Wonder is on YouTube, you can support our project then check it out the video at http://tinyurl.com/m8dmd3h ! The original MOC was built on the Disney Wonder during a cruise to Hawaii. Since then people just like you have been begging me for instructions, or to post it here, so now's the time. Relive your favorite cruise with your very own Lego Cruise Ship. We have a great blog about the trip and how the Lego Disney Wonder was built at http://tinyurl.com/ad6lge3 so after you do the support thing, go read the blog. Or you can read the blog and then come back, but please don't forget to hit the support button. We'd like this set to have enough bricks to build and decals to let you build any one of the four ships. The Disney Magic is fairly similar to the Wonder, but the Fantasy and Dream are slightly bigger, so if you go with the classic ships you'd have a few spare bricks. Check out the photos because the detail is amazing. We ran around the ship taking photos and checking everything for accuracy. The captain was even floored by the detail, and couldn't wait for us to get done with "his" ship. One side is designed to be "serious", with a wonderful water texture as the ship sails along, you can just imagine your next cruise. The other side is the "fun" side with your favorite characters lounging around the ship. Envision landing at Castaway Cay or an exotic port with the dock, autographed by your favorite characters. (You might have to go get your own autographs, but that's a great excuse for you to take a cruise or visit the parks, so go for it). It won't happen without your support though, so hit the button now! Accurate deck and plans following the real ship floor plans. Fancy scrollwork for the bow. Accurate life boats and speed boat detail. All of the upper deck pools and activity areas. Accurate stacks with detail appropriate for the false fore and working aft stacks. Crew pool for the Magic and Wonder. All the antenna, radar and masts of the real ship. The real ships keep getting remodeled, so grab your vacation photos and tweak the details match your cruise. #1, getting enough people to hit the support button, so please do it now! The Lego Disney Wonder is already built from reasonably common pieces and has been on display for some time. She is very sturdy and will be pretty straightforward to translate to a kit. The Magic is very similar and won't require much modification. The Fantasy and Dream are larger and will require more effort, but I already know how to make them work. Most of the Lego Wonder's intricate details are provided by stickers. All of the characters are placed with stickers. 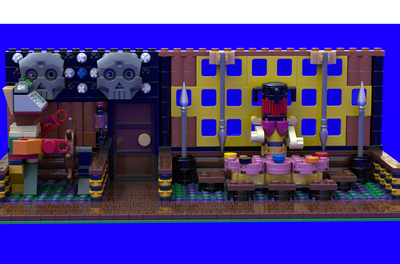 A stretch goal would be for Lego to provide small 1 stud models for Captain Mickey and the others. Probably the most important parts to improve would be the characters on the stern and the scroll work on the bow. 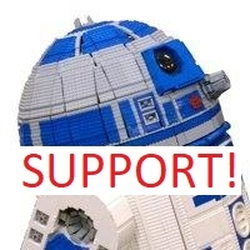 Licensing is probably the biggest challenge, and the best way to overcome that is for you to help us get the needed support as fast as we can, showing both Lego and Disney that you really want your own Lego ship. With your support we think this project has a great chance. It's an excellent model that's already been proven. Please support us now. 4500 bricks is quite a bit, so people are going to have to be willing to provide enough to make Lego think this is a feasible Lego Ideas Project.